What is variable valve timing? The variable valve timing (VVT) is the process of altering the valve timing during the running of engine. Here the valve timing is modified as the function of engine speed and load. This process often used to improve performance, fuel emission, and fuel economy. The strict exhaust gas emission regulation is the one of the main reason for automotive manufacturers to adopt VVT systems. 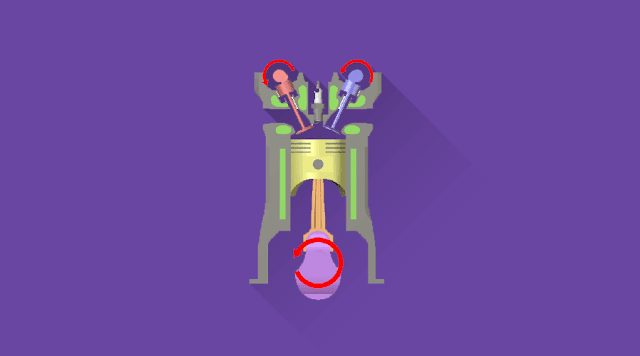 Without variable valve timing, the duration, timing and lift of the valve will be the same for all engine condition. The factors like valve opening timing and duration have a great effect on overall efficiency of the engine. For an engine which runs a wide range of speed like a racing car, the single valve timing profile is not justifiable. The VVT system free the engine from this constraint. How variable valve timing achieved? Cam switching - Use more than one cam profile, an actuator (at a specific engine speed) is used to swap between these profiles. Cam phasing - Also known as variator. It gives continues VVT but has no effect on duration valve timing. Oscillating cam - It can continuously adjust both phase and duration. But cannot adjust the duration of valve operation separately. Eccentric cam drive - Which operates through an eccentric disc mechanism. The eccentric cam drive system can vary the duration independent of lift(cam switching). Camless engines - This engine does not rely on the cams for the valve operation. So It has great flexibility having variable valve timing. However, there is no camless engine released for road vehicles. Smoother idle and low rpm running of engine. Controlling the cylinder temperature by valve overlap. Better breathing of engine and Assist the scavenging process.